Decorative napkin folding is a simple way to add a special touch to any event, and the napkin diaper is one of the easiest folding projects you can make. The following design is perfect for adding a festive atmosphere to a baby shower. Unlike most other types of napkin origami, this simple design will work with either cloth or paper napkins. Use whatever fits your budget and the tone of your event. Most of us think of diapers as being plain white, but it's fine to choose a colored or patterned napkin if needed. Pink or purple napkins would be perfect for a baby girl shower theme, while pale blue or navy napkins would be a good choice for a boy baby shower theme. Use pale yellow or green napkins if the expectant parents do not yet know the gender of their new bundle of joy. 1. 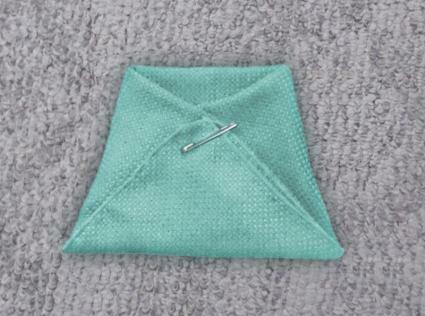 To begin making your napkin diaper, fold your napkin in a triangle shape. If you're using cloth napkins, you do not need to iron or starch them unless they are exceptionally wrinkled. 2. 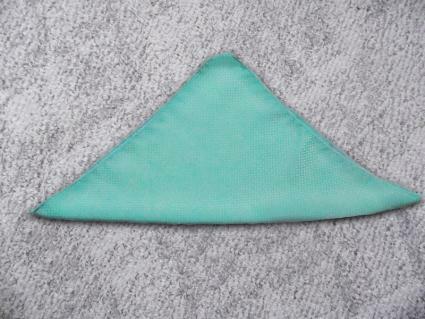 Fold both sides to the middle to start shaping the napkin diaper. 3. 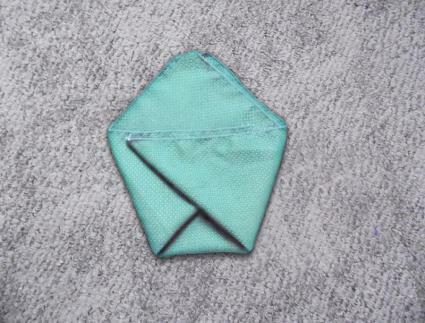 Rotate the folded napkin so the triangle point is at the bottom facing you. Bring the bottom of the napkin up over the sides you folded in the previous step. Use a large safety pin to keep everything secure. Add a small ribbon bow to provide additional embellishment if desired. If you're planning a baby shower that will include young children as guests, it would be best to fold the diapers from paper napkins and use scrapbooking glue dots or baby-themed stickers to hold them shut. You don't want the children to poke themselves accidentally as they are removing the safety pins. Since the napkin origami diaper has a pocket opening, it is both decorative and functional. Here's a small sampling of the many ways you can incorporate this design into a paper shower. Fold cloth napkins into diaper shapes, stand them upright, and fill with a few silk flowers to make a simple table centerpiece. For a formal bridal shower, fold cloth napkins into diaper shapes and slip a printed menu card into the diaper opening. If you're having a buffet style event, use folded diaper napkins as holders for silverware. To make party favors, fold paper napkins into diaper shapes and fill them with mints or small chocolates packed in tiny cellophane bags. This is the perfect low-cost baby shower favor! To make place cards, tuck a printed card with each guest's name inside the finished diaper napkin. Serve dinner rolls or cookies wrapped in paper diaper napkins to reinforce the theme of your event. If you're still looking for baby shower entertainment, use these diapers to play the popular "Name that Poop" baby shower game. 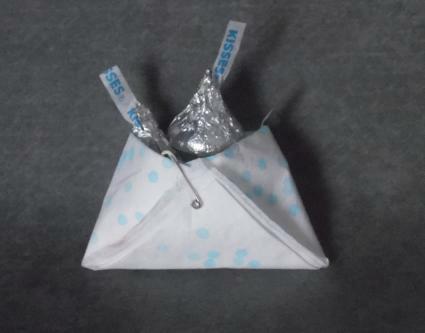 Fill each folded paper diaper napkin with a small amount of a melted chocolate candy bar. Place the filled diapers on a tray and challenge guests to guess what candy was used in each diaper. Award a diaper filled with wrapped mini candy bars to the winner. Napkin origami diapers are just one of the many different ways you can add origami to your baby shower. Try making a towel origami basket filled with baby lotion, baby shampoo, and other goodies for the mom-to-be, string together origami hearts to make a banner, or create an origami crane mobile that can later be used in baby's nursery. With a little creativity, there's no limit to how you can show your excitement for baby's arrival.